WELCOME to the SI Timeline! This website publication is a result of a collaborative effort between school improvement consultants across the state of Michigan. 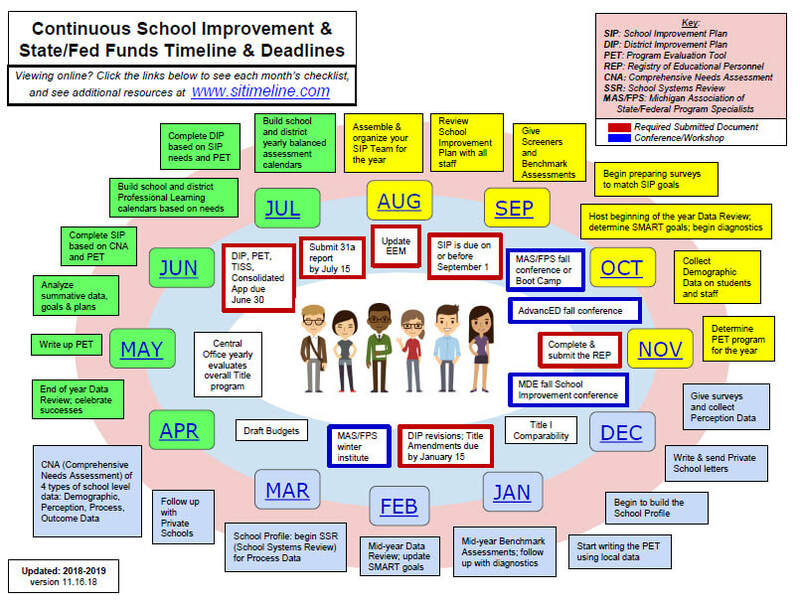 Our hope is to place in the hands of teachers, administrators, and all members of educational communities a practical timeline and related resources for the school improvement cycle. The left menu contains three different methods of site navigation with side menu bars that should "pop out" as you scroll over them. We suggest visiting the "Getting Started" page and/or the MVU online overview if you're new to the process. Veterans may wish to jump into the required reports (left menu) or the current Month-to-Month Checklist (Updated July 2018) which is now a live Google Doc in a more concise form. With the reduction in state compliance reporting, we are reducing the checklists to create a more practical approach. If you are looking for the more comprehensive checklist, here are the archived PDF's from 16/17 fall, winter, and spring . While systemically implementing the school improvement process, we often draw parallels to a Multi-Tiered System of Support (RtI): Assessing the Needs drives the process. Once the Needs have been identified, we "Develop a Plan" based on research and best-practice and the Plan gets implemented. Once the plan has been Implemented, Monitoring of the plan is the assurance the plan is being "Implemented" with fidelity and needed adjustments to the plan. Evaluating the plan is the final piece of the improvement process. All relevant data is analyzed that shows if the plan produced the desired results. School Improvement 101 is an online tutorial through MVU with 2.0 credit hours! ﻿NOTE: Any Orange Button or Orange Font word/phrase is a hyperlink that will take you elsewhere in the site or to other resources. A very helpful tool to see school improvement requirements at a glance is now available on the SI Timeline! Allegan AESA updates this one-pager every year. Click on the image on the right to enlarge it by opening the PDF. Each Month is hyper-linked to the monthly check list. In the fall, schools should pay specific attention to gathering baseline data for student growth, and effectively progress monitoring the essential (or non-negotiable) activities outlined within the school/district improvement plan (3-5 year plan posted by Sept. 1). Schools should also begin the Comprehensive Needs Assessment (CNA) by analyzing state level achievement data and demographic data. The School Improvement Process continues during the winter as monitoring of the current plan overlaps with gathering and analyzing data for the upcoming plan. Begin gathering both process data and perception data, likely through online surveys, and document on your CNA. Identify strengths, weakness, and establish causal theory within your CNA Process. Also, budget amendments to Consolidated Application are usually due in mid January. For 2017-2018, The Annual Ed Report (AER) is to be complete and posted by May 31, 2018. 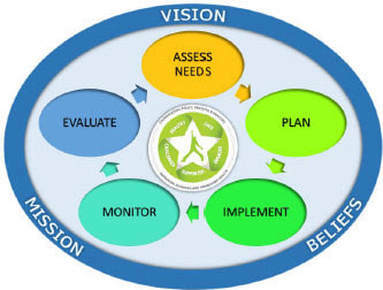 Once the strengths and weaknesses have been identified using the four types of data in the Comprehensive Needs Assessment CNA, schools/ districts usually finalize their Improvement Plans, Consolidated Application, Program Evaluations, and professional learning plans by June 30. Finally, state "At-Risk," Section 31a, funding report is also due in mid-July.